As much as I adore manmade artifice (see bees, below), it's impossible to beat nature for elegance of hue and form. Case in point: seashells. I can spend hours on a beach looking for an intact cone shell or whelk (surely the same sifting instinct that drives the charity-shop trawls). Perfect ones beached in sea rubble are as magical as dubloons . . . the moonshell that sits on my computer desk is an oasis of natural order, and a reminder that somewhere, simultaneously, it's sunny and warm. So thank you Etsy for this morning's revelation of a different way to wear two perfect shells . . . at the waist, at the ends of a loop of silk cord. 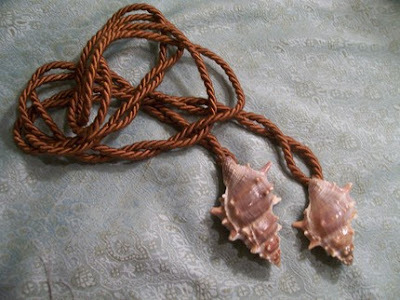 This seller is offering the belt ready made, at a gentle price, but if you happen to own a couple seashells that deserve more display time, why not find some lovely silk cord (craft shops, sewing stores, curtain supplies, etc), loop it once, then super-glue the ends deep into the shells' whorls . . . wear with a simple cotton dress or tunic. 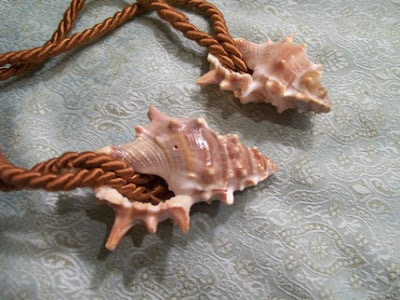 Alternately, make the loop much shorter, and wear the shells as pendants at the neck. So simple! Like nature. Vintage Mystery: What Is This Accessory?